A Remington-Sholes lately offered by eBay seller Retro-Scifi. Note the writing on the base of the machine: “Remigton Sholes Company, Chicago, MFRS.” Remigton is no typo (that’s how it really appears on the machine), but I expect it is a typo. I e-mailed the eBay seller and he wrote back, explaining: “I figured that since they were going to move the tooling to France and rename it Japy, they ran out of front labels and just hand painted the lettering.” The typo might be original. I placed a bid on this typewriter, but was soon outbid. As I write this post, bidding is up to $788, though I expect it will go higher. (PLease note that I’m camping in my trailer, so unless I’m near town, I can’t access the Internet. As this blog entry is post-dated, bidding has already ended.) Whoever finally wins (won) this machine will own (owns) a very rare typer indeed. Update: It sold for $1,576. I noticed this one too! My guess is that the decal wore off on the left side and an owner tried repainting the name there — but goofed! The Romantic view is that the mistake was made in the factory. 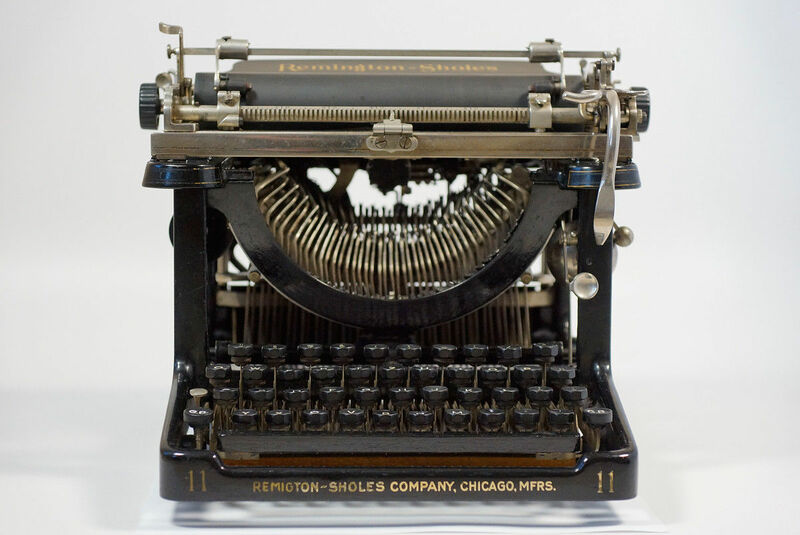 The less romantic view is that the person who restored this typewriter misspelled “Remington.” The left side certainly looks hand-drawn; the right side appears to be a decal. In any case, it is a sweet looking typewriter.